We’re absolutely thrilled to have Caitlin Murphy writing her first guest post for Raise a Mother. She is a dear childhood friend of Lindsay and Shannon, and someone we both admired as a parent before either of us had kids of our own. Caitlin is an imperfect perfectionist, empath, and mama to three wonderful wildings – with another on the way! She has a passion for working with children and families, reading, and writing, and lives with her family and husband, John, in London, Ontario, Canada. I love Christmas. There’s something about the holiday season that makes me feel like a kid again… and now, as a parent, I get to witness that magic through the eyes of my little ones! My family always had a lot of treasured Christmas traditions, and now that I have a family of my own, we’ve carried them on with the new generation. Decorating the house while listening to Christmas carols, making a gingerbread house while listening to Christmas carols, baking delicious treats while listening to Christmas carols (there might be a common theme here…) – the list goes on! But mostly, I associate the holidays with spending time with family and friends, and a general feeling of spreading kindness and the “Christmas spirit.” I wanted to share those same sentiments with my kids – to teach them that the meaning of Christmas goes beyond presents, treats, and holiday sweaters. A few years ago, when my oldest was a toddler, the Elf on the Shelf became “a thing”. My mom bought one for us as a gift, and without giving it a lot of thought, we followed the basic premise: the elf arrived at the house to keep an eye on things until Christmas Eve, we gave him a name (“Spat” – thanks 2-year-old! ), and every day he was in a new funny place for the kids to find (if I remembered to move him, of course!). It’s a cute idea, but parts of it didn’t quite sit right with me… the idea of this little dude reporting to Santa about my kids’ behaviour seems…. A little Big Brother to me. Also, some of the elf antics I’ve seen posted on Facebook or copious Pinterest posts are pretty mischievous or naughty… not really behaviour I want to encourage. As much as possible, I try to practice positive parenting, and my mom (a former child psychologist) has always said one of the best ways to encourage positive behaviour in kids is to “catch them being good.” So we decided to shake things up a little with our elf! A few weeks ago, Linds and I were thrilled to be interviewed on our favourite podcast, One Bad Mother. If you haven’t had a chance to listen to the episode, you can check it out here. Talking to friends and family afterwards, one of the main take-aways from the interview was our overall emphasis on accepting things as #GoodEnough. (Many thanks to everyone who participated in the #GoodEnough challenge — feel free to keep ’em coming!) In particular, people related to Lindsay’s experience of comparing her preparation for her son’s birthday party to my DIY prep for my son’s party a month earlier. Since this experience has struck such a chord, we wanted to explore it further. Because here is something that is true for me, that is not necessarily true in the same way for my sister — or for many others scanning Pinterest with a mixture of anticipation, inspiration and guilt: my DIY-ing gives me a creative outlet that I’m otherwise missing in my daily life. It’s actually about me. I am, and have always been, a creative person. Throughout elementary and high school, I steadily took almost every English, art, theatre and music course available (though not dance — I am not a graceful or coordinated person, just ask…anyone). Lindsay and I both participated in extra-curricular theatre groups as well as school shows. My first jobs as a teen were performing as a children’s entertainer (read, clown — don’t judge), and helping to run a kids’ theatre camp. Even on vacation, I would sit on the beach and sketch set and costume designs for hypothetical productions. And then I went to university and became an adult and I no longer had the time or resources to spend on creative pursuits that were really just for me. Sometimes, I have grand plans for a creative project that’s just for my own enjoyment, but I never seem to prioritize actually making it happen. Case in point: since we moved into our house, I have planned to paint something for a giant wall in our living room. I can see the picture in my mind. In reality, it’s four years later and I haven’t even bought the canvas, let alone picked up a brush. The wall is still sitting blank because I keep insisting that I’m going to paint one of these days. Here’s the thing, though — when I’m planning a DIY project that is ostensibly “for someone else”, it gets prioritized and I get to do something creative. I’ve been like this since well before my son was born. I took up knitting six years ago, and in that time I have knit gifts for each of my five sisters, for each of my six nieces and nephews, for my parents, for my husband, for my son. I have knit a total of two things for myself — one of which was a Christmas stocking to match the stockings I had already made for Randy and Lucas. The thing with my son’s birthday parties is the same. 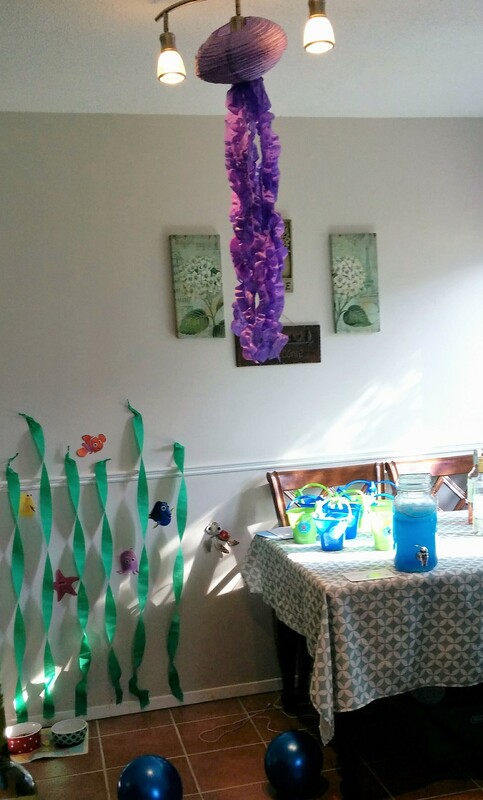 Look, mamas, we all know full well that 1) they don’t give out prizes for children’s birthday parties, and 2) my child will be happy and feel loved on his birthday regardless of whether or not there are themed decorations. We also all know that there are plenty of things out there that just make us feel bad about ourselves, that are in no way real measures of how we’re doing as parents. 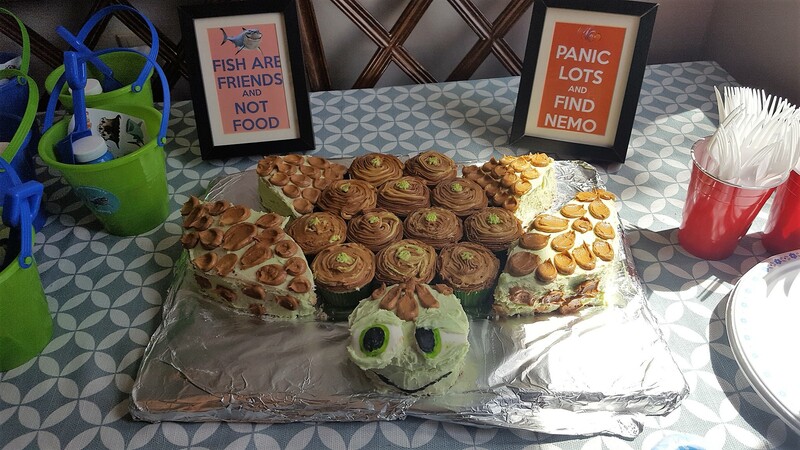 Geeking out on thinking up theme-y puns for the punch label and Pinning inspiration for a sea turtle cake doesn’t make me a good Mom. It’s not actually about my kid. In my case, doing these things makes me me. What happens when I DIY is that I give myself permission to spend time doing something creative that makes me feel good. It’s sneaky self-care. It keeps me in touch with a part of myself that was there long before motherhood, and will be there long after my kids are grown and have kids of their own. For me, DIY-ing is not about trying to be something or someone that I’m not. It’s about getting in touch with who I am. I think what makes any of us a good Mom is being ourselves, and showing that person to our kids. So, you do you, mamas! The best Moms are the ones who do. Hope everyone is having a happy Halloween today, but mostly, hoping that your evening with your kiddos is a fun, relaxing time. I hope you spend the day enjoying the love your kids have of dressing up and playing pretend, the excitement they feel at the prospect of showing off their costumes to friends and neighbours, and indulging with them in some yummy treats without worrying too much about their sugar intake levels. If it takes longer than you anticipated to get them into their costumes, so what? If you don’t get to all the houses you planned to trick-or-treating, no big deal. If your kids are up later than you had hoped, well… It’s Daylight Savings tomorrow anyway, so hopefully that’ll just get them some extra snoozing in the morning! 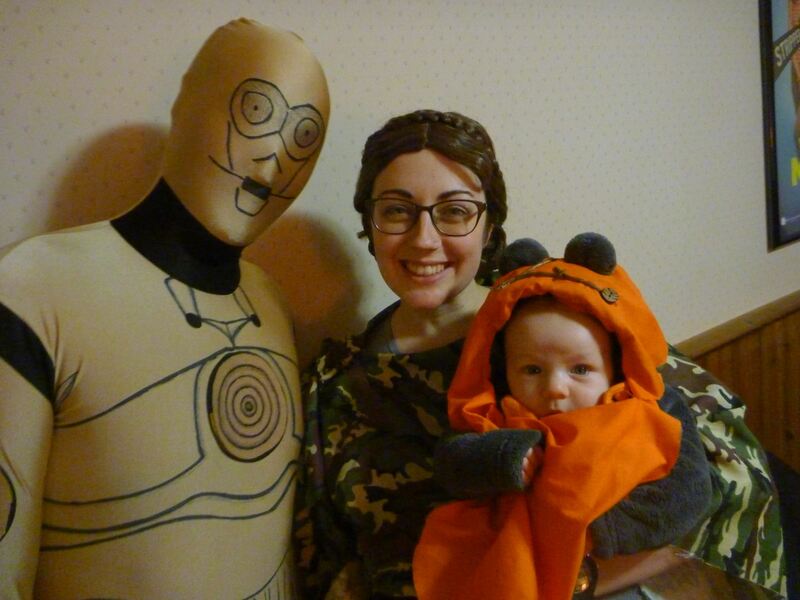 There was weeks of planning involved – the transformation of a crash-test-dummies suit into a C3PO costume, the gathering of sticks and buttons for the decorations on Arlo’s Ewok headdress, and trips to various fabric, thrift, and costume stores for bits and pieces we’d need. This year, John and I aren’t dressing up, and Arlo is wearing a one-piece, fuzzy Winnie-the-Pooh suit my mom’s had in her basement pantry since 1999 when my brother wore it. I haven’t put one bit of thought or effort into this Halloween. And you know what? 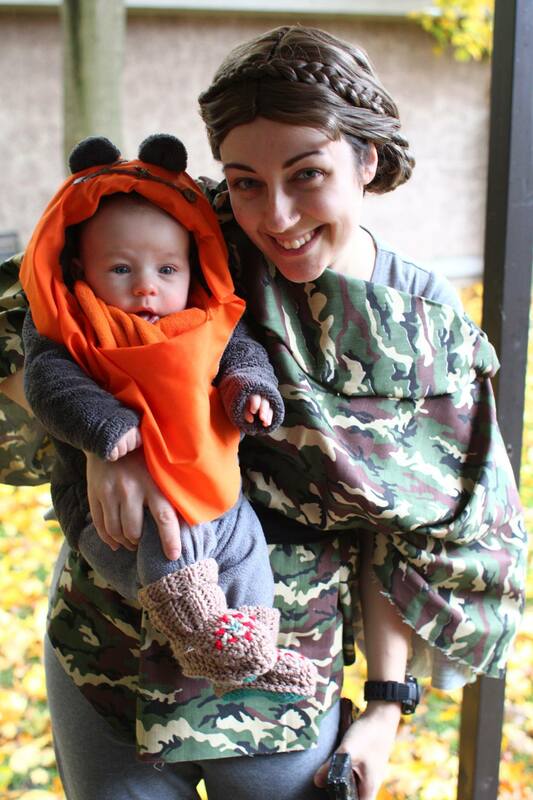 Arlo’s going to have just as much fun as he did last year, and so am I. So I hope you enjoy this Halloween holiday – because it’s certainly a time for being silly, but not for being stressed about silly things.